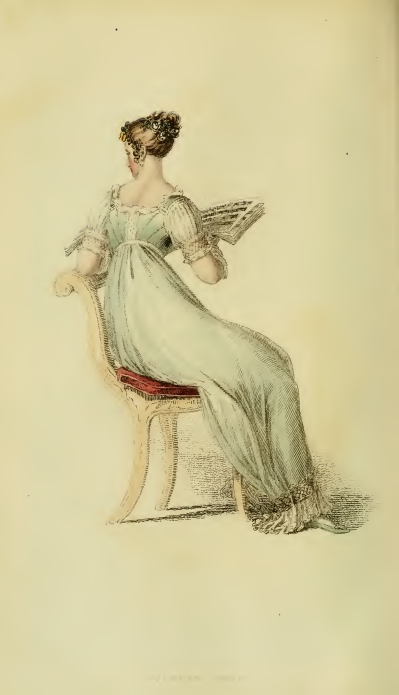 The shapes of Regency dresses are often simple, but the addition of detailed, intricate ornamentation differentiates the gowns of the bourgeois from those of the fashionable. 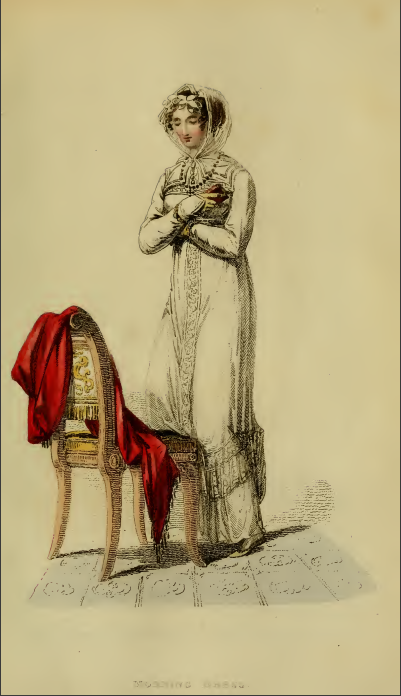 Such fancy trims are on display in Ackermann’s fashion prints of November 1813. 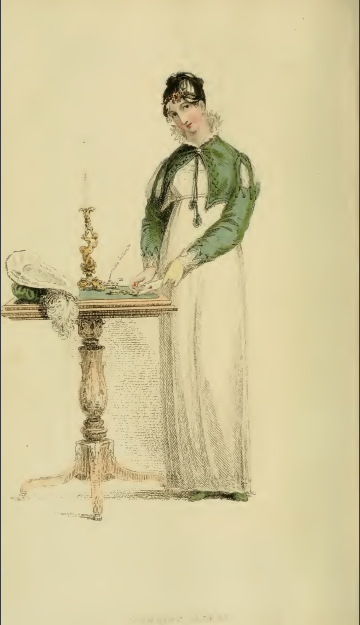 Plate 33, a Morning Dress, features a shirt with a “deep fan frill of vandyke lace, the dress ornamented at the bottom, to correspond.” Its accompanying spencer also features vandyke lace on the cuffs, as well as Spanish slashed sleeves and front embellishments made of cord and button. 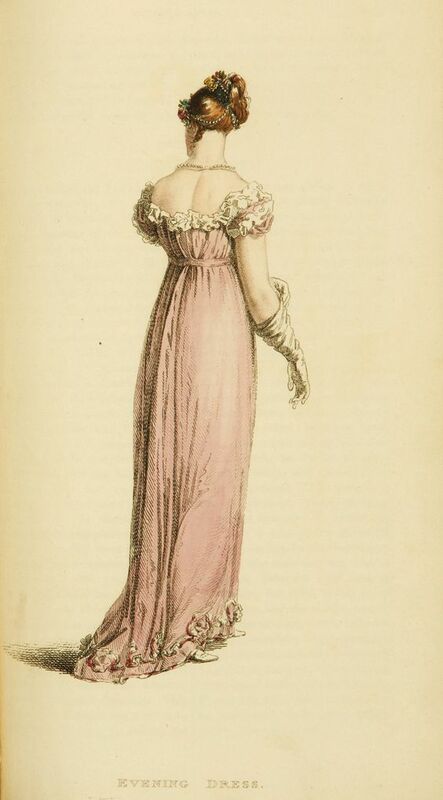 The sleeves and neckline of the Evening Dress in Plate 34 are ornamented with puckered white satin, to compliment to the blossom-colored crape of the round robe. 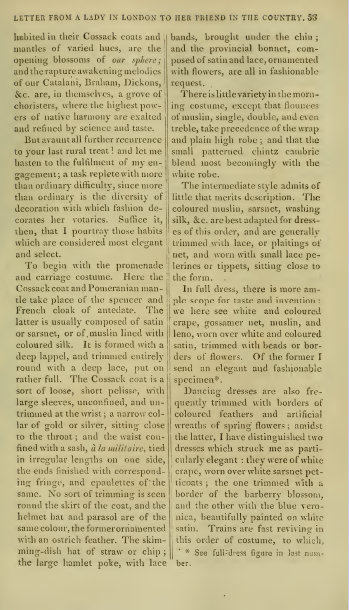 The bottom of the trained gown is also adorned, with a combination of white satin and blossom-colored crape, in what looks a bit like oversized flower blossoms. 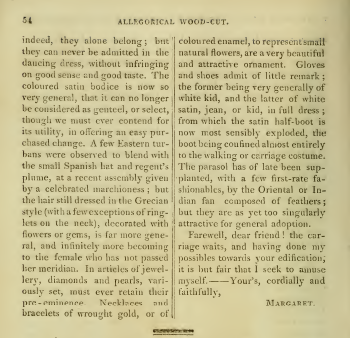 The writer notes that the gown’s “back and bosom [are] uncommonly (not to say unbecomingly) exposed,” suggesting such low cut gowns might be verging on the edge of risqué in the early years of the 18-teens. 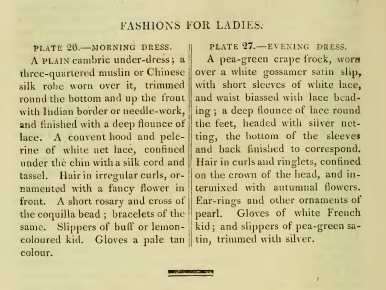 Both prints show their models wearing their hair in loose curls, curls adorned with “a small sprig of barberry” in the informal morning dress, and “small autumnal flowers of various hues” for the formal evening dress. Real flowers, I wonder? Or artful imitations? 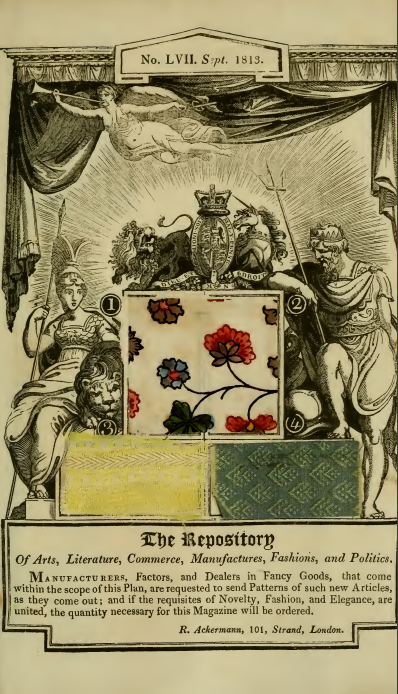 November’s fabric samples include #1, an “animated and lively sample of the true Circassian cloth,” a fabric that Fairchild’s Dictionary of Textiles reports is “a yard-dyed fabric made of wool and cotton with a diagonal wave. Original made in France with wool warp and filing; in England with mohair yarns.” Lively and warm enough for fall’s chill! 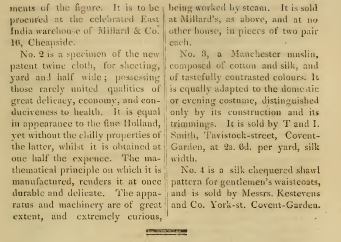 Fabric sample #2 may not look as interesting, a simple “specimen of the new patent twine cloth, for sheeting,” but its method of production is “extremely curious,” as the machine upon which it is produced is “worked by steam.” Steam-driven power looms had first been built in 1785, but this aside suggests how novel they still were in the Regency period. 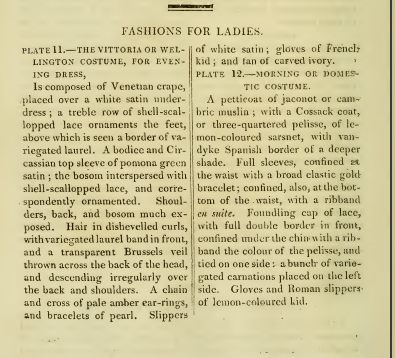 I’m as much, if not more, intrigued by the accouterments in this month’s prints than in the dresses themselves. 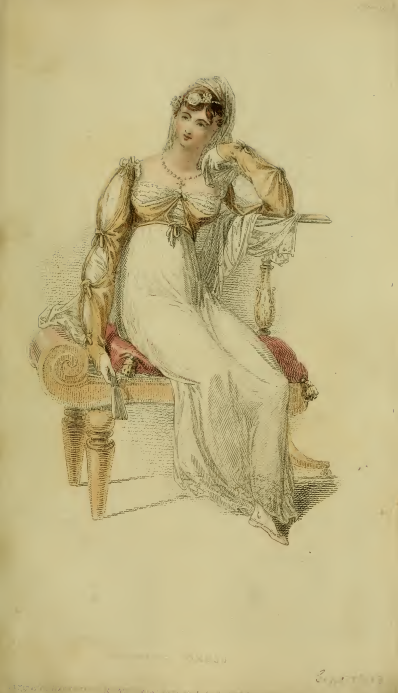 Both prints feature ladies reclining on chairs, one seated, and one partially kneeling. Both chairs have scrolled backs, and slightly curved out legs, giving both an air of elegance to the ladies resting upon them. I’m also curious about what these two ladies are holding in their hands. 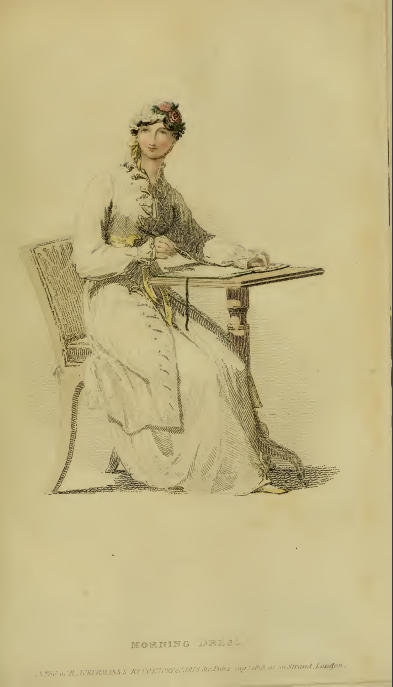 The one in plate 26, in “Morning Dress,” appears to have a tiny book of some sort in hand. A memorandum book? A small prayer book? 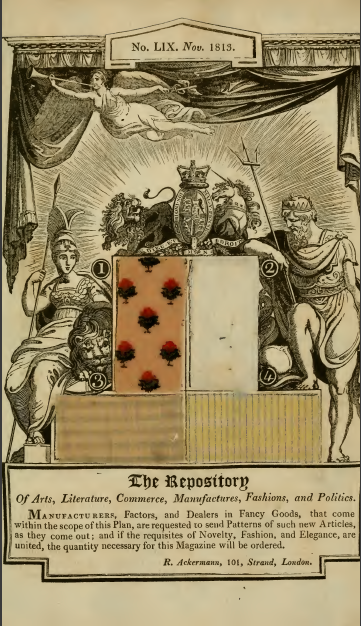 It seems far too small to be a household account book, or even a journal or diary. 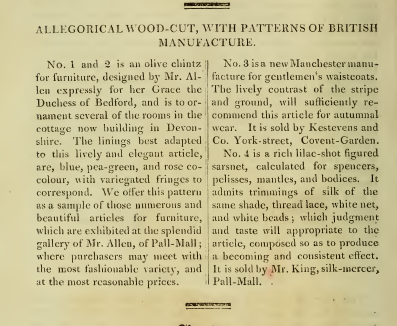 I’m drawn to fabric sample #4, described as a “rich lilac-shot figured sarsnet, calculated for spencer, pelisses, mantles, and bodices.” The sample looks more pink than lilac to my eye. The zig-zags topped with what look to be tiny French knots make for a very unusual fabric, one that would have had me hieing off to Mr. King’s silk mercer shop. 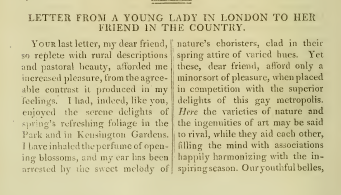 And since his shop is also in Pall-Mall, perhaps I would have also taken a peek into Mr. Allen’s? 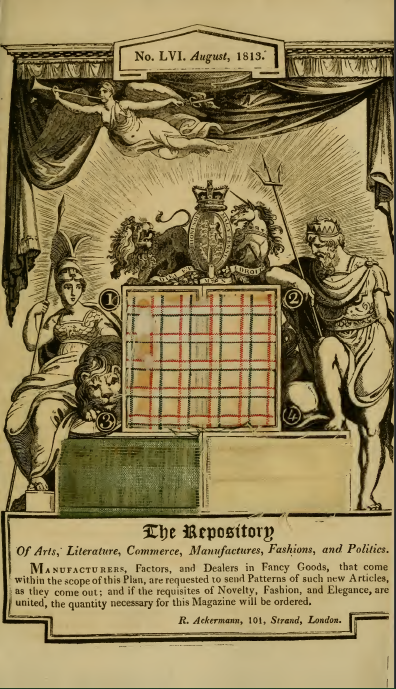 For the first time, a plate is missing from the scans of Ackermann’s I’ve downloaded via Archive.org. 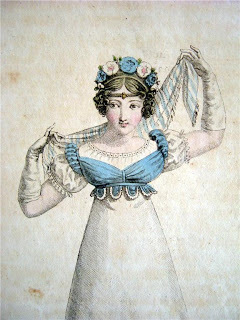 The September 1813 edition scanned includes plate 19, “Evening costume,” but the page where plate 20, “Promenade Costume,” should be is blank. 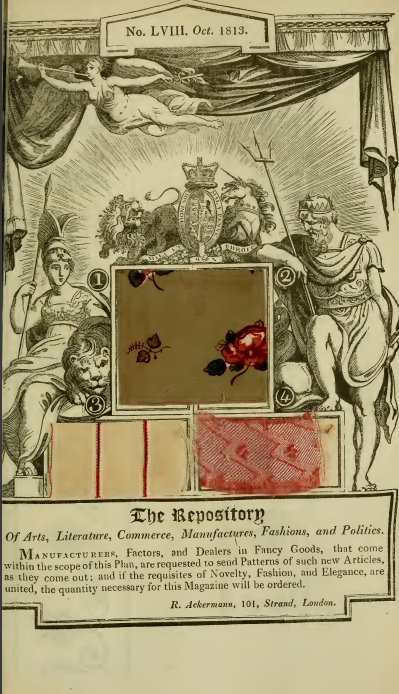 A victim of the habit of people cutting the plates out of magazines, even those in library collections, and selling them separately? Today such prints can be purchased for between $30 and $60 from rare print dealers online. 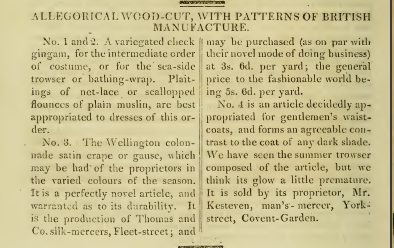 The celebration of Wellington’s Vittoria victory continues to be a theme in this month’s fabric sample #3, a “unique and elegant article for ladies’ robes, pelisses, mantles, and scarfs, styled the Vittoria striped gauze.” I wonder what the drapers might have said, if you asked them why it was a “Vittoria” striped gauze? 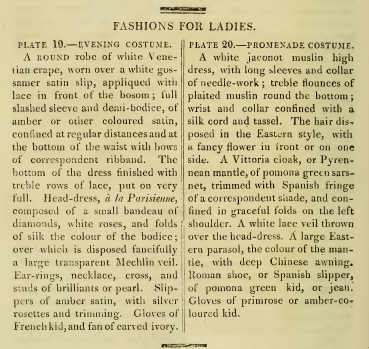 This month’s fashions celebrate Wellington’s June 1813 victory at Vittoria, which led to the collapse of French rule in Spain. 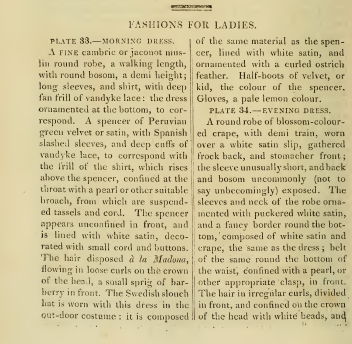 The evening dress in Plate 11 is labeled “The Vittoria or Wellington Costume,” although I don’t think there is anything in particular about its design that would lead one to think of either the English general or the town in which 1813’s battle was fought. 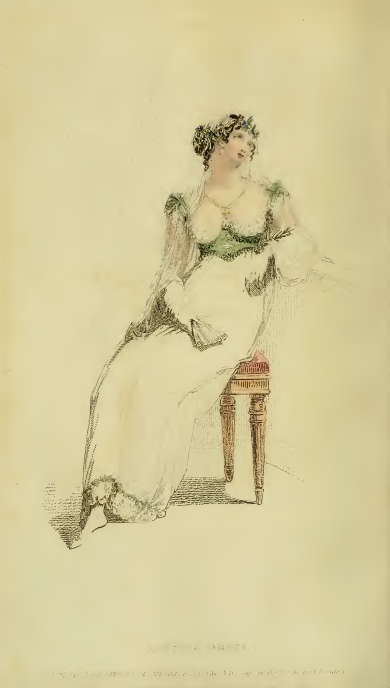 Is a dress with “shoulders, back, and bosom much exposed” a sign of celebration? 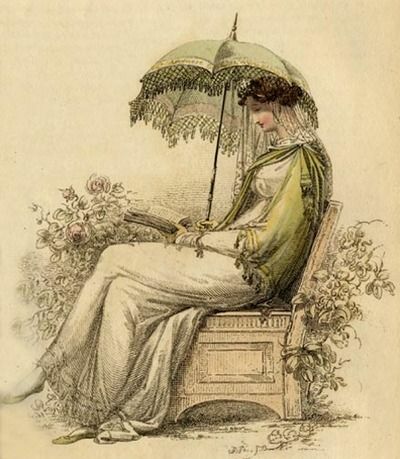 Or the bosom covered by “shell-scalloped lace”? 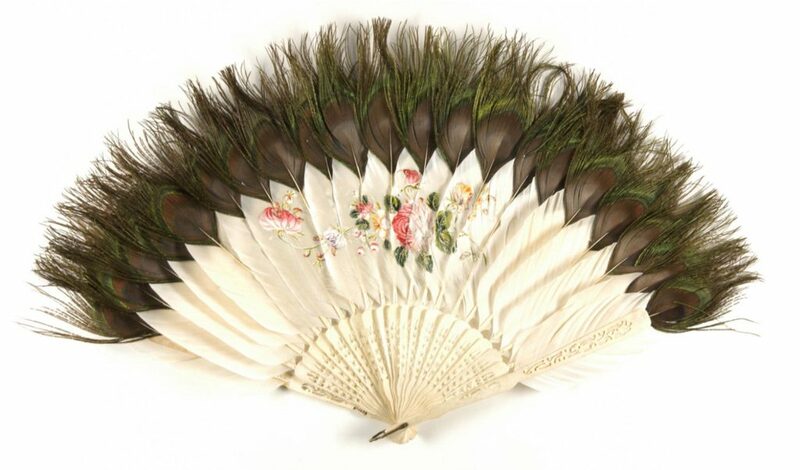 • A “few first rate fashionables” have given up their parasols in exchange for “the Oriental or Indian fan composed of feathers,” but such items are “as yet too singularly attractive for general adoption.” Wouldn’t that make you wild to get your hands on one? ?